Here is a Full Guide on How To Troubleshoot When WordPress is Not Showing SSL Padlock on Browser. Making WordPress SSL Lock to appear has tricks. Clearly know – any PHP caching, backend gzip can never create any issue with SSL Padlock’s appearance or disappearance. We shared some tricks in the guide WordPress SSL Setup Tips, but here is almost the full guide which work and there is no guide on the whole internet which has all these information at one place. It is unlikely that WordPress Support forum “volunteers” can ever help you. Their main target (not of all, but the most) is to drive indirectly towards the paid individual service advertised at WordPress Jobs. Furthermore, if it is high end setup on Rackspace with Nginx, they will fail to do anything good. We use Nginx PHP5-FPM as backend. With all these, we pass all the browsers – WordPress shows the desired SSL padlock on almost all the major browsers. This guide, WordPress SSL Lock Not Showing is to help clueless peoples fighting with problems. Using loadbalancer in front has the basic advantages including we need not to think about updating for securing against the latest vulnerabilities. However, loadbalancer in front is not recommend to use for pages which requires higher security like for transaction. You must use a Bare Metal (onMetal by Rackspace) or Colocation Server or Dedicated server instead of Cloud Server instance. The website which will require higher security includes financial websites. For $5 transaction via PayPal, you need not to bother. As we have loadbalancers in front, we need no SSL cert to be added on the servers. Our port 443 are closed, in fact which port we use is difficult to guess. It is not possible to directly access any of our main servers. loadbalancers has cache enabled and support for cookies. This is conflicting with the concept of security but practically it is not dangerous as the setup is equivalent to reverse proxying. This is only to redirect HTTP to HTTPS, so that we get a nice 301 redirection from corresponding HTTP url. You can do whatever optimization you want on server – it will not do anything for the disappearance of SSL Padlock on browser. Essentially, we need to serve the HTML files. As everyone knows, we should server only contents from HTTPS URLs – it is important for CDN. Rackspace Cloud Files does the work nicely. We need not to use a sub-domain of the website – it will require additional SSL certificate (or a wild card certificate) plus will increase the round trip delay time. This is maximum you will need to do. But, it will fail to detect many smaller things like errors due to certain web font loading, insecure content loading from the CSS or JS as call etc. 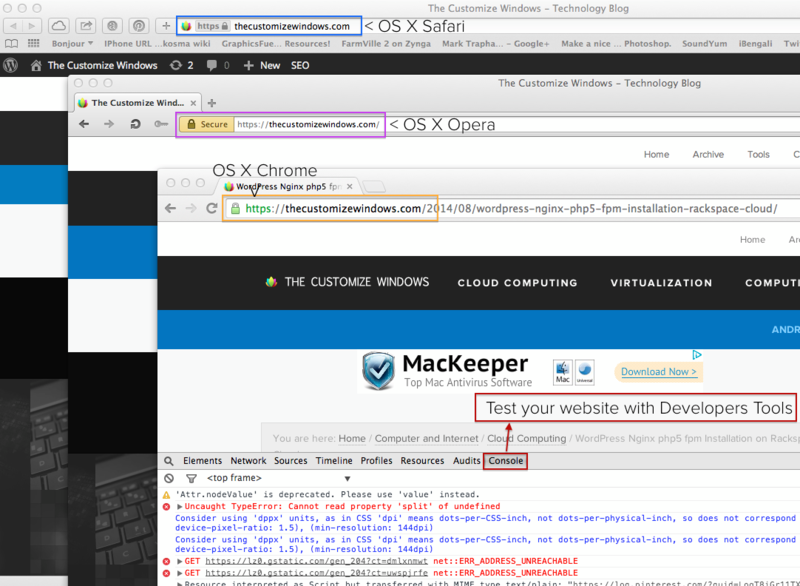 Easiest tool is Google Chrome’s Developer’s tools. This Article Has Been Shared 7304 Times! Cite this article as: Abhishek Ghosh, "WordPress SSL Lock Not Showing : Master Checklist," in The Customize Windows, August 16, 2014, April 23, 2019, https://thecustomizewindows.com/2014/08/wordpress-ssl-lock-showing-master-checklist/.